For the first time ever, two Afghan women will take part in a seven-day foot race across the Chinese Gobi desert. This unprecedented sports opportunity for Afghan women was organized by non-profit organization Free to Run in collaboration with Skateistan in Afghanistan. The Gobi March is part of the 4 Deserts Race Series and consists of a 250 kilometre, 7-day self-supported foot race, or "ultra marathon" taking place in China from 31 May - 6 June 2015. Competitors are required to carry up to 11kgs of supplies on their backs the entire way. 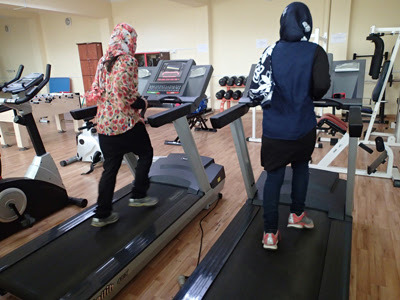 Nelofar and Zainab, two staff members from Skateistan, were selected by Free to Run founder and seasoned ultra marathon runner, Stephanie Case, through a competitive process. Although neither Nelofar nor Zainab has experience in running, Stephanie immediately noticed their remarkable mental strength as well as their desire to act as role models for other Afghan women. "I think another meaning of sport is peace, so I think if we finish the running in the Gobi March, we will bring a very big change in Afghanistan," explains Zainab. "All the females of Afghanistan will be interested in sports and they can believe it is possible, and they can believe that everything is possible for women of Afghanistan," she says. In Afghanistan, where female participation in sport is severely restricted due to certain cultural norms and beliefs about the role of women in society, simply finding a place for the women to train and run safely was a logistical Everest. "Running is so, so difficult here. If you are a girl and you want to run in the street, people think you are crazy and [there] will be lots of risk for you," says Nelofar. "But whenever I start running, I feel that I am free. I feel a different kind of freedom in my heart." Thanks to the tremendous support from their colleagues at Skateistan, and from Free to Run, it has been possible for the women to train safely at the Skateistan skatepark facility, at local gyms, and through Afghanistan’s beautiful mountain ranges on chaperoned runs. Free to Run’s team of international mentors, including world-renowned ultra runner Ray Zahab, have provided Nelofar and Zainab with advice, support and encouragement through weekly interactive Skype sessions. For one year following the race, Nelofar and Zainab will be acting as Free to Run Ambassadors in their community, helping to inspire other women to get involved in sports. "The Gobi March is not just a race", says Stephanie. "It’s a chance for Zainab and Nelofar to prove to everyone what Afghan women are capable of. This is an opportunity to redefine the strict limits that have been imposed on them by society." RacingThePlanet, a leader in endurance competitions and equipment, is providing Nelofar and Zainab with all of their running equipment for the race. They will receive the highest quality running shoes, clothing, backpacks and other items needed for racing in harsh desert climates. For this extreme 7-day run through the Chinese desert, Nelofar and Zainab have named their team, Team Asma’i, after a mountain range located outside of Kabul. What inspiring young women! Uzbek Journeys wishes them a safe and successful marathon.